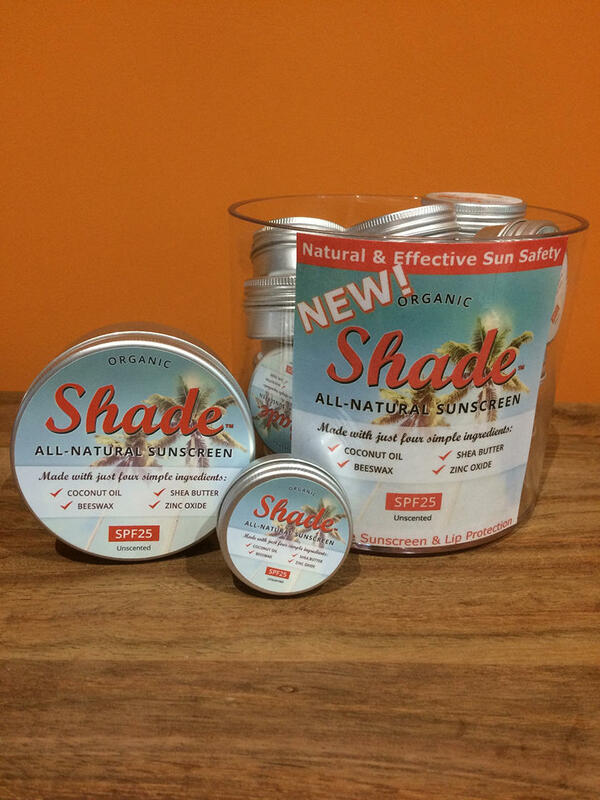 100% natural, effective and suitable for all ages and skin types, Shade™ All-Natural Sunscreen has been an award-winning product for three years in a row. This is the small 15ml tin which is perfectly handy to keep in your bag or pocket so you never need be caught out when that sun breaks through unexpectedly! Also great as a lip balm or just to see if you like the product! At an ideal SPF25, with only 4 ingredients to moisturise and protect the skin from the broadest spectrum of damaging UVA and UVB rays, Shade™ has been developed to keep your skin naturally healthy whilst blocking rays that can burn and cause sun damage. There is no doubt that you need to protect your skin from the sun but humans need some sun to generate an essential nutrient which helps to prevent cancer - Vitamin D. Getting sun is the only way our bodies will make it for ourselves. 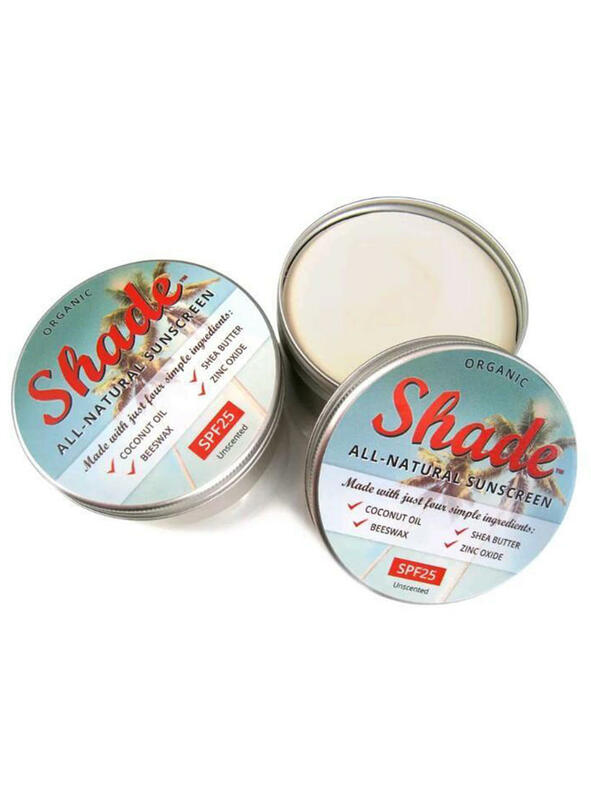 Shade™ uses non-nano zinc oxide which acts as a physical barrier to the sun, reflecting it from the skin's surface. Zinc oxide is the most effective broad spectrum sun protection you can get, yet it is also the safest. Premium pure unrefined beeswax 9% (Cera alba). Directions: Apply generously at least 15min before sun exposure, smoothing out any natural zinc oxide clumping. Reapply regularly at least every 2-3 hours, especially after exposure to water or after sweating. Naturally Occurring Zinc Clumping Effect: You may also see your cream turn from a smooth surface to a rather mottled looking surface if you don't use it up quickly. This again is a natural occurrence and is when zinc oxide crystals attract one-another because of their polarity, and hang out together in a 'clumping' effect. If this occurs, simply rub the cream into your skin really well when you apply it. Testing: Stability testing, microbiology testing, broad spectrum sunscreen testing of effectiveness against UVA & UVB rays, and SPF validation tests. All tests conducted to EU standards by Alba Science of Edinburgh. Shelf Life: Once opened, use Shade™ within 12 months, otherwise it has a shelf life of three years. Shade™ make small batches regularly each week to maximise life of the product from manufacture to customer. Packaging: Aluminium tin - reusable and recyclable. Plastic free.